In this tutorial, Anders Mouridsen will teach you "Alive", by Pearl Jam. Anders will introduce the song and look at the gear and tone, then dive into the epic opening riff. You'll learn the band hits before we break down the verses, choruses, then the bridge. The song's breakdown comes next, then we're off to the guitar solo in 4 parts. We'll detail the ending, then do full and single guitar performances before you take over in the jam along. Mike will show you both guitar parts in this song. He'll take you through the whole step down tuning, open chords and barre chords, cut time feel, steady strumming patterns, hybrid picking, and some lead guitar approaches using chord shapes. 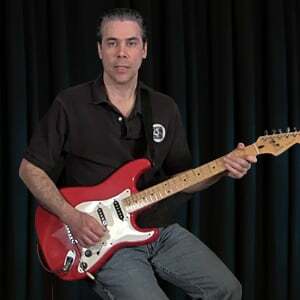 Mike will show you how to play a made easy version of this tune using simple strumming patterns, open chords and barre chords, and dynamics. This Beatles song in triple time is a beautiful example of the use of simplicity and repetition. It has several interesting features, including a 6/8 time signature, a signature, iconic bass/riff line, and a parallel minor key change. Caren will show you a made easy version of this classic pop tune. The acoustic guitar part starts solo and then serves as the only accompaniment to the vocal for the first part of the song. This is a made easy version to help beginner guitarists play along with the band on a great classic tune. Mike will show you how to play this modern R&B pop ballad that we’ll learn on acoustic in a made easy style with open and barre chords and a simple strumming pattern. In this series of lessons, Michael Elsner takes you through the various elements of the classic Poison ballad, "Every Rose Has Its Thorn". You'll learn the chords and tuning, the verse and chorus progressions, the bridge and solo section progressions, the strumming variations, the three solos, and of course a play along with our custom backing track. Dave will show you all the parts to this classic tune from the iconic opening riff, to the verse & chorus riffing to the climatic solo. Mike will show you the 2 guitar layers in this song. Guitar 1 plays the bulk of the parts throughout the tune with a clean tone, while Guitar 2 enters at the very end to add some ascending chord stabs and launch into a free time outro section. Mike will show you this song in a Made Easy format, breaking down the progression to open chord shapes with a capo, and a simple strumming pattern. Mike will show you both electric guitar layers. Guitar 1 plays the main rhythm with that iconic country-ish guitar riff played in open G tuning that gives this song its distinctive sound. Guitar 2 adds to the arrangement with single note fills. Mike will show you the 2 guitars in this song. Guitar 1 is a rhythm electric guitar that lays down a steady foundation for the tune. Guitar 2 is the lead guitar that takes the arrangement to the next level with some soaring soloing. Christopher will show you how to play this traditional classical guitar piece that has beginner level skills as well as intermediate. Mike will show you the 3 guitar layers in this song. Guitar 1 features an octave down whammy effect playing single note riffs throughout the tune. Guitar 2 features a gritty tone and a slide to play the rhythm parts, and Guitar 3 is a fuzz lead guitar that handles the solo. Mike will show you the two gritty clean electric guitars in this song. Guitar 1 is the rhythm guitar that plays some steady riffs and chords throughout. Guitar 2 combines complimentary rhythm parts with lead fills and a raging guitar solo. In this tutorial, Anders Mouridsen will teach "Let It Be", as made famous by The Beatles. Anders will talk about the song and the gear and tones, then start in with teaching the piano part on acoustic guitar. Next we'll look into the chorus of the song, followed by the breakdown riff. Next are the elements of the solo; then the extended chorus. We'll review the song form before doing full and single guitar performances, then a jam along. 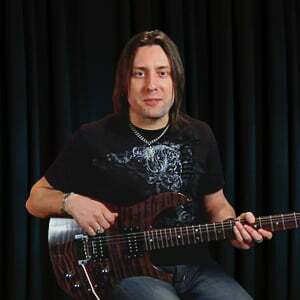 Mike will show you 2 guitar layers. Guitar 1 is the main rhythm guitar layer that provides the iconic, tough, solid riffing throughout the song. Guitar 2 adds some high voicings and melodies that add sparkle and ornamentation to the riffs.